I sorta feel guilty about blogging while at work, but still, I'm technically on a lunch break. And, I just have to bring up another Diagnostic. The order we're jotting them down isn't necessarily the order of importance that should be assigned to them. Maybe once we're done listing the diagnostics we come up with, we can look at them deeper, and order them by importance. 3: Will Kenji Johjima and Rafael Chaves have any measurable impact on the pitching staff? Okay, so that's a bit of an obscure one. I'm not much of a sabermetric stathead yet, but I do understand that things like Catcher-ERA and other similar stats aren't overly valid measuring sticks (sample size, etc...). Since statistics don't measure everything yet, I'm curious to see if there still will be any decipherable difference with the change at catcher and pitching coach. I suppose you could pull out Gil Meche and Joel Pineiro (as well as guys like Thornton, Putz and Mateo in the 'pen), and look at their performances (and that probably deserves its own Diagnostic). But, aside from statistics, I'm wondering if there's any way we can measure the impact of these two changes alone. Any suggestions on how to approach this? Even though I'm not exactly sure how I'm going to measure it, I do believe that there will be a noticable effect on the overall pitching performance. Certainly a full season of Felix (knocks on wood), and replacing Franklin with Washburn are going to add some noise into that Diagnostic. Maybe it's my gut-headedness (since I'm neither a scout nor a saber-dweeb), but I seriously believe we will see some sort of positive impact on the pitching staff, merely by swapping Price with Chaves and the 7-headed Hydra that was our catcher last year with JoMama (and whatever backup we decide we need). I'm sure we'll single out Pineiro + Meche and Kenji Johjima as Diagnostics later, but I see this one as a little bit different. 2: Where does Jose Lopez start the season? Count me in the camp that believes Jose Lopez has nothing left to prove in the minors. Last year, I wanted to play it a little bit safer and have him develop his defensive skills at 2B so that he could take over for Boone in 2006. That basically happened, and the torch was passed upon Boone's DFA. That's not the case this year. Still, whether or not it's intended as a motivational tool, I don't like the fact that Lopez isn't guaranteed the 2B spot. The M's have consistently shown a preference to give starting spots over to washed-up (or nearly so) veterans above prospects with potential. I'm still making up my mind as to the real ceiling of Jose Lopez, and what I expect out of him. My untrained eye actually sees him a lot like Carlos Guillen, who I actually thought was underrated, and who I really liked. Others see him as a Miguel Tejada type. I'm not sure that's entirely out of the question, either. Still, there's no argument that he's much, much better RIGHT NOW than Willie Bloomquist and Fernando Vina (his two rivals for the 2006 starting 2B spot). And, provided there aren't any health issues, if Jose Lopez starts the season in AAA, then you know the 2006 M's are starting off in the wrong direction. Sorry for the short delay in posting - I've been embroiled in a long debate about Yuniesky Betancourt here, here and here. Dr. Detecto views Betancourt as a premium, Grade A prospect *with the bat* - and points, strangely, to his MLB trial as evidence for this. I believe, based on seeing him play, and based on his contact ability, that he'll be an all-star at his peak. Much of his value will derive from his defense, of course, but I think he'll put up a few years in the .295/.330/.440 range, and that's plenty good enough for an all-star spot. He may not take a walk - and that's going to limit his offensive potential - but he won't be hurting the M's at all. In some parts of the M's blogosphere, this is taken as skepticism or even pessimism. But the discussion also brought up the nature, the essential qualities, of baseball prospects. It's a tough call, and you can see two very different approaches at work in the top prospect rankings from Baseball America and John Sickels. No matter if you're a 'tools' or 'performance' type prospect guy, the M's system is sort of a strange one. With the promotion of guys like Felix, Betancourt and Reed, they don't have a lot of guys that stand out - no matter what approach you use. The pitchers with the most pure talent (Fruto, Bazardo) often have blah minor league stats. The guy with some real success under his belt (Livingston) is viewed (by BA at least) as a smoke-and-mirrors guy who's luck will run out at either AAA or MLB. After reading the rather negative assessments from BA and, to a degree, Sickels; and then reading the positive reviews from Dr. D, I'm even less sure what to think about the system. But since blogging is all about shooting one's mouth off, and since I kinda want to look back at this at the end of the year, I wanted to put up a list. Please note: I'm not an expert like this guy, or this guy (easily the most underrated M's blogger). I'm just someone with the keys to a blog, and I want to get some discussion going. 1: Adam Jones - CF; potential and tools finally translated into big-time performance in Inland Empire and then San Antonio. Maybe the M's knew what they were doing drafting this guy as a hitter.... early reports on his D at CF have been mixed, but everyone's agreed that the has the ability (and, importantly, the desire) to be an impact defender. Power potential is there too. I'm just hoping to see him in Tacoma around Aug./Sep. 2: Clint Nageotte - RHP; Mr. Slider has, if his 2005 is anything to go by, reinvented himself. A former FB/Slider power arm with problematic walk rates now seems to be a control artist who induces lots of ground balls. It's asking a lot of the Arizona Fall League stats to predict he'll continue putting up gaudy K/BB rates or even GB/FB rates, but it was one of the best bits of news concerning Nageotte since 2003 or so. No one will be inspected more closely in the early going than this guy... unless perhaps it's Jesse Foppert. 3: Jeff Clement - C; 2005 top draft pick put up a very nice first year in Everett and Wisconsin. His ability to hit for average was a nice surprise, and in part made up for a lack of power (don't get me wrong - 6 HRs in 110+ ABs is great, especially in Wisconsin, but that 30% of hits for extra bases will probably grow over time). He's right on track, and the M's are right to expect big things. 4: Asdrubal Cabrera - SS; of the M's myriad MI prospects, Cabrera's the guy who made The Leap in 2005. That's something of a surprise; he was always the guy with the defensive reputation, not the big bat potential like Tui, Yung-Chi Chen or even Oswaldo Navarro. Well, that's why they play the games. Cabrera put up a .270 Major League equivalent EqA in a tough offensive environment in the Midwest League. At 19, he got a well-earned promotion to the Cal League, and even a cup of coffee in Tacoma (and I can assure you, he's every bit as good with the glove as you've heard). He's clearly willing to learn, and that shows up in a surprisingly mature approach at the plate - check out his on-base skills at Wisconsin. One to watch. 5: Bobby Livingston - LHP; yeah, maybe he doesn't have the best pure stuff in the system (though that change-up really is something), and maybe he'll never be a top-of-the-rotation guy in the bigs, but I really think people are selling this guy short. There's got to be a place for a guy who goes out and wins, and who puts up a career K/BB rate of over 4. I think people would like him more if his antipodean doppleganger Travis Blackley hadn't crashed and burned, but I think that had a lot more to do with Blackley's shoulder injury than anything. I can't wait to see the Tacoma rotation this year. 6: Yorman Bazardo - RHP; Best name in baseball, with all apologies to Jetsy Extrano and Yuniesky Betancourt. He was rumored to have high-90s velocity while in the Marlins system, and that never showed up in his stats. He was good, but didn't really strike anyone out. His stats in the M's organization have been similar, though there are more and more reports that he's now primarily a 90-93-range pitcher, not 98 mph. That's not bad, and coupled with very good K/BB rates in the Venezuelan Summer League, I'm still bullish on his chances. 7: Shin-Soo Choo - OF; Probably the most disappointing season of any M's minor leaguer (though he's got lots of competition), Choo did a lot to make people question his prospect credentials. While he's still on all the lists, more and more people are scaling back their estimations of what he can become in the majors. He hit for almost no power in Tacoma, despite that memorable (and fluky) home run over the CF wall, and didn't hit for average either. even his defense looked suspect, though that seems to affect basically every OF prospect in the PCL. As an aside, I'm really starting to wonder what the hell is going on at Cheney that guys can look so utterly lost out there and then look decent in the Majors. Jeremy Reed looked like he was under the influence of powerful drugs out there, and so did Choo. That said, Choo still has that cannon arm, and I'm willing to look past one poor year. He's not the uberprospect he once was, and we need to scale back some expectations a bit, but he still could be a solid pro. 8: Wladimir Balentien - OF; Another candidate for most disappointing season, Wlad gets the nod over the third triumvir of disappointment, Matt Tuisasosopo, due to his impressive 2004 and playing at a higher level. Wlad's power potential is simply unrivaled in the M's system, and this type of player often does develop later, but he's going to have to do something about those K's. At some point, his inability to hit breaking balls is a fatal flaw, and not just a stage in his development. I don't think we're there yet, but he simply needs to get out of the Cal League next year. 9: Sebastian Boucher - OF; With all of the guys with tons of potential and so-so performance on the various lists (Tui, Wlad, Choo), I need to give a shout-out to a guy who put up a combined 900 OPS at Wisc. and Inland Empire. He's a college guy, and some say he was old for the Midwest league, but he wasn't that old for the Cal League, and put up a line of .352/.453/.474. Not a huge amount of power, but very solid OBP plus a 15/3 SB/CS mark means that this is a guy with some value. And hey, for those that talk about developmental versus actual age, this guy's canadian. I bet he's played fewer innings of organized baseball than guys four years his junior who come up through the dominican, or even the southern US. I'm really curious to see what he can do in the high-minors; another huge year like last year, and he'll shake that 'future fourth OF' tag once and for all. 10: Luis Valbuena - 2b; I really don't know much about him, but he did win the NWL MVP (edit: J points out that this is a straight-up lie. My bad. Just keeping you on your toes. Or something), right? There's always room for a middle infielder with power, and that's what Valbuena brings to the table. There's plenty of room for doubt - he's only played SS ball, he hit in the 260s, etc. But everyone seems to agree on his potential, and with 12 HRs in 270 ABs, why not? OK, how wrong am I? Well, one of my old blogging stomping grounds is back in business. I'm sure I'm not alone in that I started my blogging career over at the P-I M's Blog. I used to call it the Soap Opera M's blog, because it felt like being involved with a soap opera, moreso than a baseball blog. Still, when Mike shut it down for the winter, I will admit to missing it a bit. Certainly it got outta hand, but I was aware of that, and I kinda liked its personality. After a few months, it appears that John Hickey has awoken the P-I M's blog from its hibernation. Some of the old regulars are re-appearing. Nice to see it hasn't been shut down completely. And, it's also nice to see Hickey taking on the task. While he's not perfect, he's actually a decent writer, and appreciates bloggers. I'll take that. Especially since I'm sure everyone at the P-I is quite nervous about the Times/P-I JOA disappearing. You have to register now, but that started actually before Mike shut it down for the winter. It's a hoppin' place, though, so go read some Spring Training Fluff, if that's your thing. Joe Mama? What sort of crass sobriquet is this? Jamie Moyer, my one-time nemesis, the living embodiment of all that is NOT Carl Everett, and this is what you get, folks. Not 'guile' not 'intelligence,' just the studied indifference towards the team's new starting catcher and the sort of vulgar neologism that Ozzie used to create in chicago simply by mangling the english language. I'll be grateful not to hear about a certain south American nation at every turn - I may not always see eye to eye with Mr. Hargrove, but he does not subject his charges to repetitive reminders of his heritage. Bloomquist is just the sort of homespun yokel I've been defined against my entire career. Many will say his 'hustle' and quiet confidence evince a better, or at least older, form of baseball before oversized egos got involved. Make no mistake: this means before more talented (often black) players showed up. His is not a quiet confidence, it is the absence of confidence. William hasn't earned confidence yet; how could he: he is the not-so-proud possessor of a .341 career slugging average, if the adjective 'slugging' can fairly be applied to such a figure. He a blank non-entity upon which fans who never played above high-school imbue with such meaning - he is what they believe they were. They're not far wrong. Yes, I play the game differently. I'm good at it, for one. If I celebrate 'too much' it's only because I'm passably familiar with success - ie., cause for celebration. The objection is always 'pretend like you've been there before' or words to the effect that a truly confident player needn't resort to theatrics. To paraphrase Whitman, you say I contradict myself? Very well then, I contradict myself. I am large, I contain a multitude of extra-base hits...I shall sound my barbaric yawp throughout the AL west, and there's not a damned thing you, Willie Ballgame, Mike Hargrove, or the entire nation of Venezuela can do about it." The talk in M's blogland recently concerns the relative worth of Mike Hargrove. Is he so blinkered by his love of vague, ineffable 'grit' and the slightly more understandable 'veteran-ness.' The Larry LaRue article that occasioned this discussion mentions that Hargrove (or LaRue) thinks that Willie Bloomquest has the inside track at the 2b job over the player that basically 100% of M's blogs prefer: Jose Lopez. This discussion takes place against a backdrop of a larger debate: how much better are the 2006 M's compared to last year's model. So what I'd like to do is propose a series of checks or tests that I think bring the differences in approach (we'll call them 'Good' and 'Bad') into high relief. Here's the first in what I hope is a series. 1: George Sherrill gets more than 50 IP. You knew this was coming, didn't you? Seriously, it's no longer enough that Sherrill break camp with the team. I know, I know, he'll have more good competition for the loogy role and others (Gonzales, Jake Woods, Thornton, etc. ), but after all he's done in the PCL, and after making it clear that he can both handle pressure AND get K's in the major leagues, I'm simply not satisfied with having Sherrill on the team. So the first milepost has to be that Sherrill is used in a more appropriate role. Think of the great bullpen lefties recently - guys like Mike Stanton of the last Yankees dynasty, or M's killer Paul Assenmacher for the Indians (he pisses me off even now, over a decade later. I want Sherrill to sow that sort of visceral animosity among Angels/Indians/A's fans), or Arthur Rhodes for the M's. These guys routinely piled up 60 IP, often 70 or more. I like Jake Woods. Have him take the Sherrill role of LOOGY/PCL dominator. 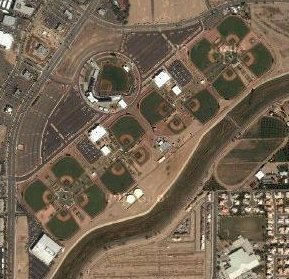 1) Pitchers and catchers have reported to the Peoria Sports Complex in Peoria, AZ. Wnter break is over for those guys, and by this time next week, the entire team. They're back in the rank and file of us workin' folks. Okay, well, I do know that the time between the last game of the season and reporting day isn't exactly club med for most MLB'ers (and MLB-wannabes). Indeed they work nearly as hard during the offseason staying in shape and keeping their skills polished enough to survive Spring Training. For older guys, that's probably even more true. 2) My new camera should arrive today. It's new only in the sense that it's new to me, and having purchased it on eBay (though from a reputable east-coast used camera dealer), I'm really not sure of its exact condition. It's got a 100-day mechanical warranty if anything DOES go wrong, and it's built like a tank to begin with. This means I'll now get better pictures at Cheney and Safeco. I'm most certainly going to blog over at "PhotosByPaulM" so I won't bore you even further with details on this acquisition (and my true adventures into d-SLR crossover). But it still makes me giddy anyways! 3) It's sunny outside. Sure, it's freakin' cold (hovering around 40 right now, and a beautiful 30 degrees when I left for work this morning -- and it's going to be much colder this weekend), but at least the clouds have temporarily disappeared. Although I haven't really been to too many other places (nevermind LIVED anywhere), I'm quite certain that the PNW is one of the most beautiful places to live when the clouds are in hiding. Here's to hoping you have a great day today, and that some of my general excitement and joy rubs off on you! No, it's not a forgotten Ludlum thriller. Yesterday, it was USSM's position roundtable on the M's exciting SS prospect. Today, Dr. Detecto counters with a characteristic barrage of optimism. The discussion on both blogs, as these things are wont to do, tends to side with the authors and, if anything, push what are reasonable predictions towards the extreme. To sum up the two camps in an almost cartoonish bout of reductionism, one has Yuniesky developing into a light hitting defensive wizard - someone who's quite close to his offensive peak right now, and not someone who's really going to develop more power or a great deal of patience as time goes on. The other side sees him as on the tip of greatness - that, for all intents and purposes, we're talking about a truly great, hidden, offensive prospect. So: Cristian Guzman or Miguel Tejada? Obviously, there's a pretty large middle ground there, and we here at MM/FGS are perfectly happy occupy it. The idea that Detectovision is keying on is Betancourt's historical uniqueness - that his PECOTA comps are all wrong because they're not looking at his swing and its power potential, and they can't account for his layoff and rapid rise through the M's system. This is countered by Dave Cameron's insistence that we've seen the like of Betancourt before, and there's a pattern in similar players' development. Doing a bit of digging today, I've got to say that I'm shocked at how many players that have a lot of superficial similarity to Betancourt there are. It's actually not all that rare for someone to break into the big leagues as a slick-fielding SS at or before age 23 and do a bit of damage with the stick. Garry Templeton, Alan Trammell, Tony Fernandez, Dave Concepcion - and, more recently, Royce Clayton, Guzman and Jimmy Rollins all came up and had pretty darn good offensive years at or before age 23. Basically, it's not immediately clear how unique Betancourt can really be. Worse, a lot of these guys (Templeton, Guzman, Fernandez) started declining as early as age 25. Forget slow or no growth, Templeton was worse at 26-27 than he was in his first ML trial, as a 20 year old. That's where USSM is coming from. There are mitigating circumstances here, of course. Betancourt had basically a two year layoff, and he's had extremely few professional at-bats in his career. But it's not as if he never played baseball before 2003 - he was in the Cuban leagues for a while, and we tend to discount that as we don't know what to do with Cuban stats, were we able to get our hands on them. It's not exactly double A ball down there, I'm guessing, but it's probably at least Rookie ball, and that's important. I think Templeton and Rollins may be his best comps. Look at the way Templeton flew threw the minors, jumping from AA straight to the majors and staying there for 15 years. Look at the season this guy had at age 21!!! We always tend to think of him as the loser traded for Ozzie Smith in a historically lopsided deal, and that's unfair: this was an all-star and someone who looked like a surefire hall of famer. The point is, it would appear there ARE a lot of comps for Betancourt - guys who had better years at 23 than Betancourt will have next year (come on, make me eat my words, JuBet!). But there's a flip-side here. Those who forecast an empty average at best, beware: this type of player seems to break out with some regularity. Templeton never really showed a lot of power potential before busting out over 60 XBHs at age 23. Guzman had mid 400s SLG potential, and many say it's only injuries that have kept him from returning to that plateau. Trammell was, in the 1980s, an absolutely terrifying hitter to face - and he hit 3 HRs in a season and a half of minor league ball. Jimmy Rollins (my pick, based on nothing more than a hunch, of Betancourt's 'best' comp) has 15HR power, generated from a Woody-Allen sized body. It's kind of tough to say that Betancourt won't grow into a surprising SLG percentage. I'm not betting against it. I guess I don't see uniqueness that DOV sees, but I think the USSM crowd may be discounting some of Betancourt's potential a bit too much. I would absolutely love 5-6 seasons like Guzman's 2001. It's the sort of thing that's well within reach; I'm not saying YuBet is going to challenge Bonds HR record here. And it would also utterly transform the M's line-up - remove slick fielding liabilities like we had with David Bell and Omar Vizquel and plug in a .300 hitting, .440 slg, gold-glover in at SS? Get some improvement from Beltre, Lopez and Reed, and you've got a core line-up that can challenge anyone. Of course, you can always see their entry for Safeco Field, which is cool, too. After their second consecutive 90+ loss season brought me much disappointment, the Mariners didn't exactly do much to reinvigorate me during my truly favorite season -- the Hot Stove League. Am I the only one who feels like this offseason just flew by? With a week to go until the first official workouts begin (and a few more weeks until games begin), it's time to wrap up a few things. It appears to me that, outside of perhaps Howard Lincoln and a few other M's FO staff, most people's expectations are pretty low for what the M's will do in 2006. Flame wars have erupted between those people who believe the M's, right now, are an 85+ win team, and their rivals who want to lynch Bavasi right this very minute. I'm inclined to believe that the M's, realistically, will win 82-85 games this season, and will see this as good progress. Getting back to .500 is a very decent goal, considering the anchorweights that still hover over this team (Spiezio's contract, etc...). The optimistic side of me, too, sees that if a few things fall the M's way (as opposed to the last few years, when everything seemed to go against them), they have an outside chance of making the playoffs. Jeff Weaver is still available. I know he wants more money than he probably deserves. Still, he's a good, solid pitcher that would definitely help the M's. I haven't heard anything other than that the Angels were interested -- if the price is right. It's hard to believe he's held out this long. With Molina signing on with the Jays, he's the only real interesting guy out there on the market. I'll admit to being swayed by Dave Cameron's argument for taking a flyer on Kevin Brown. But the common theme, Mariners-wise, is that the M's really need one more starting pitcher. Weaver's too expensive, and Brown's too old and injury-prone. Still, while Lee Pelekoudis argued on KJR this morning that both Meche and Pineiro should pitch well this season (since they're both "pitching for contracts"), and Washburn & Felix is definitely an upgrade over Sele and Franklin, I'm still not very confident that the M's FO has built the best rotation it possibly can (given what they have, and what's available on the FA market). With the M's offense hinging tremendously on breakout years out of Reed, Lopez and (possibly) Yu-Bet, as well as bounce-back seasons out of Beltre and Ichiro, I'd feel much better with this team's chances of actually making the playoffs, were the Pythag scale tilted towards reducing the Runs Allowed totals. As the Hot Stove is turned off, and the burners cool into hybernation, I'd really like to see the M's take a chance on one of these guys. If the unimaginable would happen, and the 2006 M's actually make the playoffs, I'd probably feel more comfortable giving the ball to Weaver or Brown than Meche or Pineiro. Before anyone gets out their red pens and edits the title, yes, that's how you spell it! You see, Stollen is a traditional German bread-cake usually seen around the holidays. It would remind some people of fruit cake. Really, it's a bitter-sweet type of aliment that's not too bad (that is, if you've ever had it fresh). While marc w missed the 1997 season to a European excursion, I happened to miss an 8-week chunk of Griffey's 1989 rookie season while in Germany myself (and at least the Internet was more widely available in 1997 -- I still have the newspaper scraps my dad sent me, informing me of Griffey's injury). So, what's the deal talking about a German fruitcake on a Mariners blog? Obviously the word play would inform you of my true feelings about the Super Bowl. 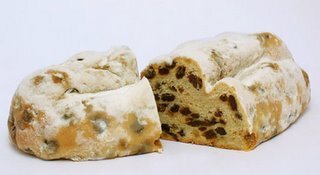 But my real reason to talk about Stollen today is so that we can all break bread together and find some things to laugh about and enjoy looking forward to. To find positives in the current gut-punch.To attempt to cure my current ailments, thinking about the German aliment. 1) Baseball season is about to begin. Pitchers and catchers report in nine days. I'm fairly certain a good number of them are already down there. Rafael Chaves will actually be an upgrade to Bryan Price, and I do believe the players' hype of Pentland. 2) The Seahawks have something more to prove. They're still hungry. Alexander has motivation to return. As does Hutchison. Reports say that Allen and Holmgren will meet to discuss an extension as soon as next week. Provided the key players (Alexander, Hutch, MoMo, etc.) return, the Seahawks should be the team to beat in the NFC. 3) Days up here in the PNW are starting to get longer. In my neck of the woods, the sun is starting to come out again. Our summer water bills shouldn't be too bad. 4) The school year (for those of you who are students) is closer to its end than its beginning. Sure, that means harder tests and finals, and projects can't be put off any longer. Dare I mention spring break? 5) The negative mojo that seems to have covered the Mariners the past two seasons, found its way across Royal Brougham. I'm not saying that's a good thing, but my loyalties are definitely deeper to the M's right now than the Seahawks. I sure find it hard to watch a Sonics game. But, for Mariners fans (and players), .500 should be a lock this year. I don't expect the playoffs, but a return to .500 would be just fine for me. Were Howard Lincoln to up the budget a bit, giving Bavasi a little bit more flexibility, the playoffs aren't that far out of the picture. So, that's a few things. 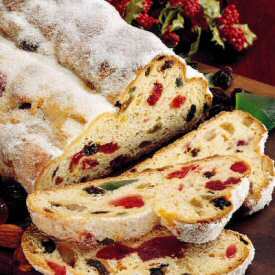 Hopefully those morsels, and the pictures of the Stollen brighten your day! I was born in 1977. The same year as my beloved Mariners, one year after my beloved Seahawks. In the years since then, I've been amply rewarded for my faith in both teams. I've seen Curt Warner, Jacob Green, Steve Largent; Ken Griffey Jr., Edgar Martinez and Alex Rodriguez. The great Seahawks teams of the 1980s led by Kenny Easley, Dave Krieg, Joe Nash, etc., more than made up for the mediocre M's teams of Matt Young, Pat Putnam and Spike Owen. Then, the M's caught fire - first with a nucleus of young talent led of course by Griffey, A-Rod and Randy Johnson, and later with a team without stars or weaknesses. If the M's had never finished higher than third, I would still be thankful that I got to witness such an alignment of baseball talent. There are fans of teams who've won multiple World Series titles that haven't witnessed the pure joy, the thrill of a game like this. If that was to be the limit, the ultimate reward for my fandom, I'd be okay with that. It wasn't of course; the 1995 team's comeback from a seemingly insurmountable Angels' lead, the 1997 team's progress were both incredibly exciting, even though I was living far from Seattle at the time. I was in Europe for the 1997 season - a fact that made it both difficult and incredibly rewarding to be a fan. Fellow M's fans gathered together and it was there that I felt most personally the virtual community that being a fan engenders. I remember talking with another fan about the acquisition of Roberto Kelly like it was the most important thing in the world; we talked about how far that McGwire home run must have travelled and what it must have looked like and *sounded* like. Following the M's via the nascent internet (with Lynx browsers! Kids today have never understood the discrete charms of a UNIX-based browser! Look at me, I'm not even 30 and I talk like this...) was an incredibly powerful thing - I've never felt so connected to my hometown as when I listened to Dave Niehaus' voice coming through my crappy computer speakers (another factoid for the kids: listening to MLB radio feeds over the internet used to be free). I've harangued countless sports fans in bars from Seattle to Slovenia impressing the point that it's in every mathematical sense 'better' to have won 116 games in a season than to win a World Series. I even believe this. The vagaries of a short playoff series are nothing compared to the true test of a long, 162 game slog. The sheer number of games, the statistical dominance in every facet of the game, these in a sense fill in the blanks left by a Seattle-less World series. That Sasaki and Rhodes came up short in singular moments that we all remember just reinforced the point that a postgame series comes down to about 4-5 single pitches - and what does THAT tell us? Come, all ye who declaim small sample sizes; if this doesn't prove the point that postseason series reward luck - that postseason series *lie* - then what does? There's a non-neglible chance that if *I* threw those same pitches, the M's would be World Champions. And that's exactly the point: it doesn't, in any mathematical or moral sense, detract from that team that those pitches 'got away' and resulted in the cosmic injustice that is: Arizona Diamondacks, World Series Champs, 2001. And yet... anyone who's a fan of Football/Baseball gets into it understanding the ground rules. That is, despite the gross injustice towards statistical significance that is our playoff system, the champion IS crowned on the field. If you don't like it, you can follow the English Premier League, in which a team can win the Premiership (ie., the league) without winning the 'playoff' - which in this case might correspond to the FA Cup or the Champions League. 'Champions' - in several varieties - multiply and flourish, and while I respect that (I've been known to say that the Mariners won the 'Premiership' in 2001 to English friends who don't know better), there's something about letting it ride on one short series - about risking it all, and concentrating the thrill of victory in 3-4 competitions into one, sweet moment - that's incredibly seductive. Of course, it's all theoretical to me. But imagine what that must be like when it all comes down to one game. We've all got that chance now, and I don't want to let it slip away. As a secular man, this is a strange place to be. It's also illuminating that the analagous activity to prayer for the secular guy is blogging, but so be it. To whatever force controlling luck; to whatever processes that tip the scales in an essentially random contest, hell, to randomness itself, I beseech you: please let the Seahawks win tomorrow. I've been a damn good soldier. I've watched every game; I've stood by this team when it's offensive stars included perennial pro-bowlers, and when it's started Dan McGwire/Jeff Kemp/Kelly Stouffer. It's not been without painful moments - the record for punts in a year stands out as a time in which I COULD HAVE switched allegiances to another, less pitiful team. But, in reality, I couldn't have. This is my team, for right or wrong, and I'd like that 'faith' validated in some real, meaningful way. Again, it's been validated before - (Nov. 11, 1990, Dec. 31, 1983), and no one has been more diligent in their midrash of playoff losses than I, but at some point, you've got to bow to the majority and accept that a Superbowl really does mean something, and something more than an assemblage of moments and superstars. I accept that. I know I can deal with disappointment, with coming so close, that losing feels like a slap in the face of logic, to say nothing of hope. I'm just tired of it. Now please, please, let me be allowed to opine on the 'playoff seasoning' of young players. Let me be allowed to cast doubts on the abilities of certain players to win 'the big one.' As anyone within 300 miles of Boston knows, it's not just the football team that wins a Superbowl, it's the fanbase as well. And while we don't get rings, we do get priveliges. I propose, humbly, that I've earned those priveleges. C'mon, Howard, Don't Let THIS Happen! You may recall that at FanFest, I was able to gab a bit with Mariners' GM Bill Bavasi, both on and off the mike. I genuinely wanted to know the reason why the M's were not pursuing Jeff Weaver. Don't get me wrong -- I don't think Weaver's the greatest thing, and he very well may be a pitcher like Gil Meche or Joel Pineiro, who's highly touted for awhile, but just doesn't seem to be able to put it together. Still, he has pitched decently and has proven himself to be mostly healthy. He can give you 200+ fairly effective innings. His peripheral stats are more along the lines of Kevin Millwood than Jarrod Washburn, and if we were going to give out an ace's contract to a non-ace, I would've given it to Jeff Weaver over Jarrod Washburn. Typical Boras client stubbornness is one of the reasons Weaver remains unsigned so close to Spring Training. News today, though, is that Weaver is being targeted by Anaheim. According to the article, the Angels would only be willing to give him a 1+1 option deal, and that Anaheim could be the front-runner since Weaver prefers to stay in SoCal. Bavasi divulged that the M's were avoiding Weaver only for financial reasons. Not only did Weaver want too much money (uh, Washburn, anyone? ), but the M's were content with the budget they'd set. Bavasi liked Weaver, and thought he'd be a good pickup, but only if Weaver dropped his asking price. I was going to ask Bavasi another question -- if he was looking at the relatively thin crop of free agents this season, and hoping to tread water long enough to grab a few guys off next year's potentially better crop. I wish I would've been able to ask both questions, but since Deanna didn't get to ask her question, I'm glad he was able to respond to my question. Personally, though, I would look at what's available this year, especially since our cupboard's pretty empty of starting pitching. Jeff Weaver would definitely help this pitching staff. We need starting pitching help, badly. Howard's response to my asking him for more money, really showed me that the M's are preparing for empty seats. They're raising single-game ticket prices, too. With the Seahawks diverting some attention away from the M's, it's entirely possible that the front office is preparing for some serious financial issues. While our division rivals continue to improve their teams, we sit back and pretty much maintain the status quo. C'mon, Howard, step it up. Get in the game! Winning would do wonders with the wealth! The recent Cleveland/Boston trade that sent Coco Crisp to Boston in exchange for Andy Marte has inspired a great deal of discussion around the M's - and national- blogosphere. The Lookout Landing diary here inspired a debate concerning Crisp's bat, and the discussion at USSM focused equal attention on Crisp's defensive value. Today, Baseball Prospectus weighed in with an article from Joe Sheehan taking a moderate approach: the Indians win in the long run, but Boston picked up a good player who may push them over the top right now. A number of commenters on the deal see it rather simply: Boston got fleeced. The value of Andy Marte (BP's #1 prospect in baseball for 2005), or rather his potential, far outweighs what Crisp brings to the table, even if he gets a bit better, or even if he is a slightly above average CF (which many debate). Marte did quite well in the Southern League at age 20, hitting for power despite being younger than just about everyone he was facing. Clearly, he's an elite prospect, and someone that PECOTA, among others, expect great things from as early as 2006. Both players were 20 years old, and both played in the Southern League. I can't say that one is obviously better; what stat matters to you when looking at minor league stats will obviously determine your answer. Some would say that player B is a singles hitter who may fizzle out against better pitching. Others might argue that Player A's strikeout rate is unacceptably high, and shows he'll be overmatched in MLB, or settle in as a Russ Branyan/Rob Deer 'three true outcomes' type. If you haven't already clicked the link, Player B is M's megabust Marc Newfield, a talented outfielder the M's drafted out of high school in California in 1990. He didn't hit for a great deal of power coming up (though his 18 HRs in the season linked above, at age 20, is not too shabby), but he was 6'4" and over 200lbs, so people just kinda thought it would come. It didn't. His MLB career line of .249/.303/.375 is pretty much replacement level personified. I have no idea why he never panned out; he played in the one and only game I ever saw in Fenway Park, and was always a favorite of mine, long after it became apparent he wasn't the guy who would put a stop to the M's revolving door at LF. The point here isn't that Marte is Newfield redux. The point is that teams discount for prospects, and they're right to. For every Randy Johnson, who rewards a team for valuing potential, there's a Newfield or a Patrick Lennon, that punishes a team for the same quality. And a team that's quite close to competing for a pennant might prefer the sure, if unspectacular, thing to the spectacular, if hypothetical, brilliance of today's uberprospect. Is Crisp a potential star, or is he just Randy Winn with a cool name? What do we do when defensive stats say Crisp is an elite LF, but scouts say he's not? What will Marte become in 2-3 years? When looking at prospects, what quality is more important, plate discipline or pure power? How do we, as fans, treat injury rumors (like we had with Marte)? What else are we going to talk about in January/February? "Well first, I'm excited to be here. I think this is a class organization, from management on down, that values a diversity of opinion, that values commenters, and you can really see that in the day-to-day operations of the site. After talking it over with my family, and with my agent, we decided Mariners Morsels was the best choice. I'm glad to have it done with, and I'm glad to get to work building a winner here." Asked if his new blog can rise up and challenge divisional heavyweights Lookout Landing and USS Mariner, Mr. W replied, "Obviously, we feel we have something to offer; Paul would never have gotten into this business if it wasn't for the readers. Or George Sherrill. The point is, we like where we're at now, but I'm also impressed with the plan ownership's put together here. This isn't a stand-pat sort of place, and I like that. And let's not forget that hit counts aren't the only way to measure greatness. I mean, Paul's got a picture with a great ML relief pitcher for his troubles. Baseball Prospectus championed Bobby frickin' Kielty for like a year, and I've never seen any of those guys get a picture with him. I respect BP, don't get me wrong, but there's influence, and there's results. Paul's results oriented." At the end of the conference, this reporter was able to speak with blog owner, Postive Paul. Though trying to maintain a typically positive spin on the acquisition, it soon became apparent that Marc W was not originally in the Morsels' plans: "I thought I was signing that Marc Normandin guy who always comments on LL. W's great though. He'll add....something." Positive Paul was then ushered out of the room through a side door.